Peace, serenity, and outdoor seating as comfortable as it is inviting. We rolled it all into this corner module to provide added versatility to your outdoor seating options. 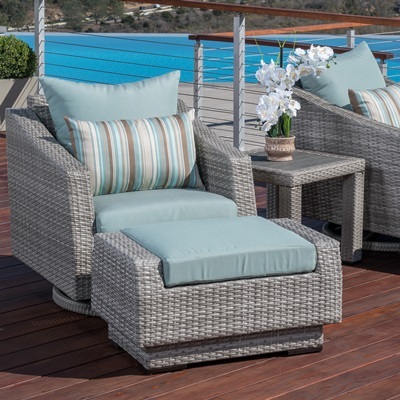 Distinctive styling, a powder-coated aluminum frame, and weatherproof cushions make this virtually maintenance free and designed to last for years. Use this corner chair to add to an existing outdoor seating set, or as a standalone piece for smaller spaces. Set includes a corner chair with two coordinated accent pillows. 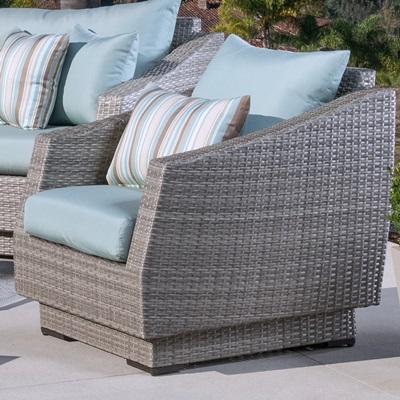 Hand-woven, gray SolarFast® resin wicker in a two-tone color weave is UV, weather, and water-resistant. Adjustable feet allow you to level the furniture on any surface. Seats come fully assembled, with minor cushion cover connection required. Designed to coordinate with the pieces in the Cannes Collection by RST Brands. Seating Height (with cushion): 19 in.